The gathering was addressed by the Afghan President, and the Hezb e Islami leader Gulbadin Hekmatyar, who took part in the signing gathering through a Skype call. Hekmatyar thanked the participants of the gathering and called upon the conflicting parties and Afghan government for a long lasting peace in Afghanistan. “To see the day when the interference of foreigners come to end, whole of the foreign forces oust, complete peace prevailed, armed rivalry exchanged by political differences, and neither a single bullet fired nor a drop of blood spilled for the transition of power”, says Gulbadin Hekmatyar in his Skype message to the Afghan government and High Peace Council members and the participants of the gathering held in Kabul. “It’s need of the hour to put an end to fight and keep peace in the country and no bloodshed of people take place”. Hekmatyar told that they (Hezb e Islami and Government of Afghanistan) have reached peace deal in a process of two years. “I believe that by signing the peace deal we will have longer peace in the country”. He told he wished all conflicting groups (Mujahideen and Taliban) would have made peace, but the attacks in Kunduz delayed the foreign forces, otherwise they (foreigners) would have left Afghanistan in 2016 as vowed by the American President Barack Obama. And now the number has decreased to 90%. Afghan President Ashraf Ghani had earlier welcomed the peace deal and congratulated the High Peace Council of Afghanistan for their struggle and peace restoration in the country. Ghani had called on other conflicting groups to join the peace process. Pres. @AshrafGhani congratulates HPC on peace agreement with Hezb-e-Islami and encourages others to join the Afghan led peace process. Dr. Abdullah Abdullah, chief executive of Afghanistan welcomed the decision of the Hezb e Islami chief for peace. He told the gathering that nothing in the peace deal would hurt anyone’s rights. He thanked everyone who was part of the team reaching for peace deal with Hezb e Islami Afghanistan. “Call upon the fighting groups (Taliban) to put an end to the war, bloodshed and come out for peace”. 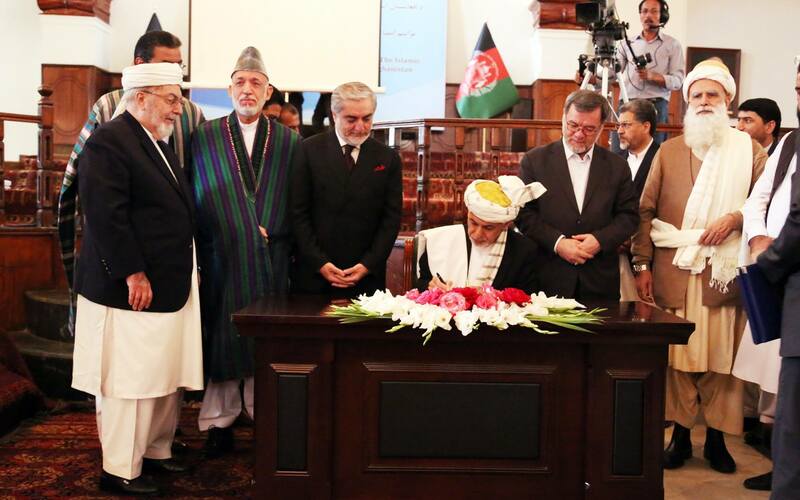 Former Afghan President Hamid Karzai, High Peace Council head Pir Syed Gillani, Cleric and Political leader Sayyaf were part of the peace deal gathering. “I think National Unity Government should not have signed the paper remotely. It shows that Gulbadin has the upper hand and also distrustful of NUG. Furthermore, from a protocol point of view he is now equivalent to a head of state, since Ghain is the counterpart. I don’t think he (Hekmatyar) is sincere”. Ramin Anwari, an Afghan has tweeted “Another dark day added to an already massive collection of dark days, as Hekmatyar completes a group of criminals ruling Afghanistan”. Lina Rozbih criticizes Hekmatyar’s past and calls him “butcher” becomes “hope” for Afghanistan. “Butcher Of Kabul becomes Afghanistan’s New Hope For Peace, too many contradictions in one sentence”, Lina Tweeted from her account.